Once upon a time there was a little engine. 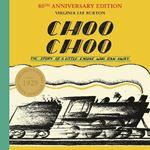 Her name was CHOO CHOO.The story of a beautiful little steam train. She pulls carriages from the city to the country, and back again. At least she does till one surprising day when she decides to run away. Her exciting adventure makes one of the most captivating books imaginable.